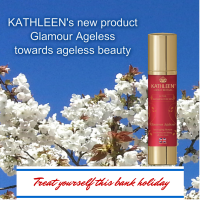 Kathleen chooses awesome nutrients for your facial skin. Glamour Ageless contains 9 purest ingredients. Build up: Skin cells need collagen to make them strength and elasticity. Coenzyme Q10 helps build collagen providing structural scaffolding for cells and tissues. Fill up: Healthy skin also needs plenty of water, hyaluronic acid attracts more than 1,000 times their weight in water. Silk protein smooths out fine lines. Protection: Those natural oils, apricot kernel oil, coconut oil and olive oil, build a protective barrier on our skin, protecting against the effects of environment stress and irritants, balancing skin beauty but without leaving a greasy residue. Just keep using every day and night, the results are visible.